This is a traditional belt icon image of the early 19th century. This painting was painted by a Russian artist and icon painter Andrei Rublev in a size that is taller than a man. This is one of three icons Rublev called “Zvenigorod rite.” Although scientists prove that the icons were originally 7 pieces. 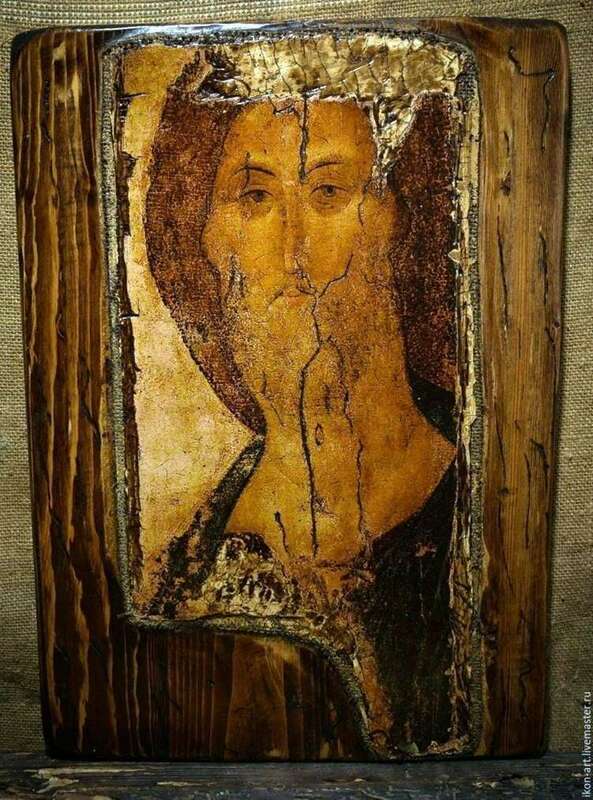 Only a fragment of this beautiful icon has reached our days. The picture shows cracks, frayed. Painting has suffered greatly and acquired such a view, but despite this it has tremendous cultural and historical value. The artist masterfully conveyed the fullness of Russian goodness. The painting depicts the face of the Deesis Savior. His gaze is thoughtful and calm. The author was able to masterfully depict all the features of the Savior’s face: he humanized Jesus, endowing him with blond hair, small eyes, a beard, a straight and thin nose, a small mouth, a slender neck and an elongated oval face. Most of all here attracts the viewer’s attention, his penetrating to the depths of the soul, look. He pierces through the one who looks at the face of the Savior and tries to understand the beholder. He allegedly appeals to people, asks them to come to him, talk and calm down, forgetting all their pressing problems, repent. He is trying to convey to them his love and benevolence. In this image, he appears as a loving father who is willing to wait until the last soul of the righteous. The image of the Savior as if comes to life before our eyes. Originally, the gospel was in the hand of Jesus, but time could not convey to us the full picture. It is assumed that the book occupied most of the picture. Critics emphasize that the artist created his unsurpassed masterpiece in the tradition of Byzantine painting. One feature of this canvas is that there is no severity in it, which is inherent in Byzantine paintings.